Canon, Inc. (キヤノン株式会社, Kyanon Kabushiki GaishaTYO: 7751, NYSE: CAJ) is a Japanese multinational corporation that specializes in imaging and optical products, including cameras, photocopiers, and computer printers. The headquarters are in Tokyo, Japan. Originally established in 1930, to create high-quality cameras, Canon has become a leader in digital imaging and networking, and a major manufacturer of personal and office printers, copiers, controllers and fax machines, as well as medical, semiconductor, and broadcasting equipment. Today, Canon’s net annual sales average 4,157 billion Japanese Yen (US$40.23 billion), and Canon employs almost 130,000 people in more than 200 companies worldwide. 2.6 Birth of Canon, Inc.
2.8 Autofocus SLR Camera, "EOS"
A key to Canon’s success has been innovation and research. Canon, Inc. consistently devotes approximately 10 percent of its net sales to research and development annually; in almost 70 years, Canon has been issued 26,528 U.S. patents. Some products developed from Canon research and patented technology include the laser beam print engine, Bubble Jet Printing systems, plain-paper copying devices, eye-control focus systems for cameras and camcorders, and optical image stabilization for video cameras, broadcast lenses, and binoculars. Canon maintains a commitment to social and environmental responsibility. It is recognized for producing some of the world’s most energy-efficient technology, and for its recycling and sustainability initiatives. The New England-based environmental organization Clean Air-Cool Planet places Canon at the top of their list of 56 climate-friendly companies. Canon, Inc. was originally established in 1930, to create high-quality cameras, an ambition first realized in 1936, with the release of the Hansa Canon, the first 35mm focal-plane shutter camera. Through technological innovation, Canon has become a leader in digital imaging and networking, and a major manufacturer of personal and office printers, copiers, controllers, and fax machines, as well as medical, semiconductor, and broadcasting equipment. Today, Canon’s net annual sales average 3,467 billion Japanese Yen (US$ 33,585,373) and Canon employs almost 130,000 people in more than 200 companies worldwide. A key to Canon’s success has been innovation and research. Canon is one of the most prolific inventors of consumer and professional imaging solutions. Canon Inc. consistently devotes approximately 10 percent of its net sales to research and development investment each year. In 2004, Canon ranked third worldwide among all companies for the number of U.S. patents issued. Canon has maintained a global ranking among the top five companies for the past 20 years, with a total of 26,528 U.S. patents granted in almost 70 years. 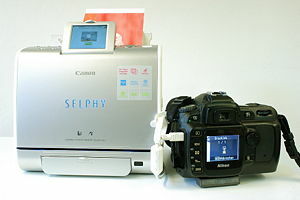 Some products developed from Canon research and patented technology include the laser beam print engine, Bubble Jet Printing systems, plain-paper copying devices, eye-control focus systems for cameras and camcorders, and optical image stabilization for video cameras, broadcast lenses, and binoculars. Business Week magazine places the Canon brand in position 35 among the best global brands. In 2005, Canon was number 30 on Fortune’s All Star list of the World’s Most Admired Companies, number 5 for the computer industry. The rankings were based on worldwide survey of 10,000 directors, executives, and security analysts at major companies. Financial Times listed Canon as number 25 among the world’s most respected companies, and Canon Inc. President and Chief Executive Officer, Mr. Fujio Mitarai, as 10th among the world’s most respected company leaders in a survey of more than 1000 respondents from 25 countries. Canon Inc. company headquarters are at 30-2, Shimomaruko 3-chome, Ota-ku, Tokyo. In 1930, Goro Yoshida (1900-1993) and his brother-in-law, Saburo Uchida, established Precision Optical Instruments Laboratory (精機光学研究所, Seiki Kōgaku Kenkyūjo), funded by Uchida’s close friend, Takeshi Mitarai. Their original intention was to develop a 35 mm rangefinder camera. During the early thirties, the two most popular brands of miniature camera, Leica and Contax, were produced in Germany. At that time, a Leica camera cost 420 yen, while the average starting salary of a university graduate in Japan was around 70 yen per month. Yoshida disassembled a precious Leica camera in an attempt to develop a high-grade 35mm focal-plane-shutter rangefinder camera of his own. In June 1934, Yoshida and Uchida released their first camera, the Kwanon. Three variations of this product were advertised; however, there is no evidence that any of them were actually manufactured or ever reached the market. Precision Optical Instruments Laboratory was off to a good start, except for one problem: They had not yet developed a lens for their cameras. Several alternatives were considered, and finally an arrangement was made with the corporation, Nippon Kogaku Kogyo (Japan Optical Industries, Inc., the predecessor of Nikon) to use their Nikkor lens. In February 1936, Precision Optical Instruments Laboratory released the "Hansa Canon (Standard Model with a Nikkor 50 mm f/3.5 lens)," Kwanon's first commercially available camera. "Hansa" was the trademark of the Omiya Shashin Yohin Co., Ltd. (Omiya Camera and Accessory Shop), which had previously concluded an exclusive sales agreement with the Precision Optical Instruments Laboratory. The following year the company name was changed to Canon to reflect a more modern image. The company moved to Meguro Ward in Tokyo, and appeared to be experiencing steady growth. In reality, business conditions were tough, and it was reported that the production volume ranged from a maximum of 10 "Hansa Canon" cameras per month to barely one camera per week. To overcome its financial difficulties, on August 10, 1937, the Precision Optical Instruments Laboratory was reorganized as a joint-stock company and its name was changed to Precision Optical Industry Co., Ltd. In the middle of 1937, the company decided to produce its own lenses. Yoshizo Furukawa, the company's first optical engineer, developed some lenses on a trial basis, such as the 50mm f/4.5 lens, and the 45mm f/0.85 lens for 16mm cinecameras. He was also involved in developing lenses such as the 50mm f/3.5, and 135mm f/4 and lenses for an indirect X-ray camera. The name given to these lenses, "Serenar," was derived from the word "serene," meaning "clear, calm, and tranquil." In 1942, Takeshi Mitarai (1901-1984), a friend of Saburo Uchida, became president of the company. An obstetrician by profession, Mitarai had enthusiastically supported Uchida since the early days of Precision Optical Industries Co., Ltd. Mitarai established the post-war foundation of the company. He emphasized several initiatives for Canon enmployees, including the "Sanbun-setsu System” (sharing of the company profits by employees, shareholders and management), a "Competence-Based Promotion System," and the "Family First Concept (GHQ, or 'go-home-quickly')." When World War II ended on August 15, 1945, the Precision Optical Industry Co., Ltd. was temporarily disbanded. It resumed operations less than two months later, on October 1, 1945, after Mitarai recalled its former employees. The first Canon camera after the war, the "J II (Post-War Popular Model)" was produced using raw materials scrounged from the rubble of war-torn Japan. Records show that only three cameras were produced that year. In October, 1946, the company introduced an "S II" camera, which combined the viewfinder and coupled rangefinder in a single window. In April, 1949, the "II B" camera, featuring a three-mode optical viewfinder, was released. These two models helped to consolidate the post-war foundation of the company. On September 15, 1947, the Precision Optical Industry Co., Ltd., changed its name to Canon Camera Co., Ltd., in response to complaints from their customers in the Occupation Forces that it was very confusing to have three different names, Canon for the cameras, Serenar for lenses, and Precision Optical Industry Co., Ltd. for the manufacturer. After 1947, the name "Canon" was used as a trademark for both the cameras and lenses. Three years later, in August, 1950, Mitarai traveled to the Chicago International Trade Fair in the United States to observe trends in the camera market, and to look for opportunities to establish a sales network in the United States. He visited the Bell and Howell Company headquarters, seeking their cooperation to sell Canon cameras in the United States. The management of Bell and Howell turned him down, because they believed that no matter how good they were, Canon cameras would not be accepted in the U.S. market as long as they were made in Japan. Another reason for the rejection was that Canon's factories were housed in wooden buildings that could easily catch fire. Immediately, Mitarai decided to build a new factory. He purchased the site of the former Fuji Aviation Instruments Co., Ltd. plant, located in Shimomaruko, Ohta Ward, Tokyo, and in June 1951, a new factory building was completed, constructed of non-inflammable materials and with the most modern facilities. During the first half of the 1950s, Canon released one new camera after another. The "III" camera was the first in Japan to have a shutter speed of 1/1000 second, and the "IV" camera that had a flash rail that enabled a flash unit to be mounted directly on the camera without a connecting cable. The “IV Sb2” camera, released in March 1954, had even faster shutter speeds, that could be set in two-fold increments. Canon's first 8mm film cinecamera (movie camera) the "Canon Cine 8T" was introduced in November 1956. The first Canon Single Lens Reflex (SLR) camera was the "Canonflex," introduced in May,1959. With subsequent advances in SLR camera technology, SLR lenses evolved, from the R-series lenses to the FL-series lenses, which incorporated a fully automatic aperture control mechanism. The FL-lens technology ushered in the era of TTL (Through the Lens) metering, with the debut of the "FX" camera in April 1964. The "Canonet," a 35mm lens-shutter camera, introduced in January, 1961, was an instant record-breaking success. Competitors complained that its price was too low. Sales were astronomical, and acceptance by customers was so overwhelming that the February 6, 1961, issue of "Shukan Bunshun" (a popular weekly magazine) published an article entitled, "Go To Hell!! Canonet." In the 1960s, Canon began to diversify, producing business machines such as electronic calculators and copying machines. The time had come to alter the public perception that the company was solely a manufacturer of cameras. With the intention that the company would become a comprehensive manufacturer of imaging and information processing equipment, its name was changed to Canon, Inc. on March 1, 1969. In March 1971, after five years of development, the "F-1," designed exclusively for professional photographers, was unveiled. It offered multiple functions and a systematic configuration, and had more than 180 accessories, including high-resolution lenses and filters. The F-1 proved to be durable, and performed well even under harsh conditions. It quickly gained wide popularity among professional photographers, and was named the official 35mm camera for the 1976 Summer Olympics in Montreal, Canada, and the 1980 Winter Olympics in Lake Placid, New York. In 1972, using technology developed for the F1, the company produced a high-speed motor drive that allowed a camera to shoot 9 frames per second. The 8mm film cinecameras continued to evolve, incorporating improved zoom lenses, new film standards, and the XL system. The "Cineprojector T-1" released in April 1972, achieved the complete synchronization of image and sound, the so-called "lip-synch" function. In April 1976, Canon released the "AE-1" camera, the world's first 35 mm Auto-Exposure (AE) SLR camera equipped with a central processing unit (CPU). The camera integrated the latest electronics and optics technologies. The "AE-1," and the "A-1" introduced in April 1978, with five AE modes, were a great hit. A New FD lens series, with an innovative fit-and-lock mount system, enabled easy and quick mounting and dismounting of lenses and became very popular. Canon introduced its first lens-shutter 35mm autofocus (AF) camera, "AF35M (Autoboy)" in November 1979. The camera featured an infrared active AF system developed by Canon, which allowed focusing even in the dark. "AF35M" was a totally automated system including automatic film winding and rewinding system. After the emergence of a unified 8mm video format in 1981, Canon began developing video camcorders. In 1985, Canon released the first integrated 8mm video camcorder in the world, the "Canovision 8VM-E1." The era of 8mm film cinecameras reached its end with "AF310XL-S," released in September 1982. In the 1980s, a new technology using magnetic media to record images as a substitute for film was developed. Making use of the electronic image transmission tests conducted during the 1984 Los Angeles Olympic Games, Canon developed and released the “RC-701,” the company’s first still-video (SV) camera and a group of system components, in 1986. In 1985 and 1986, Minolta and Nikon introduced full-fledged 35mm automatic focus (AF) SLR cameras. Canon determined to develop "a highly-refined AF SLR model deserving Canon's name” by the target date of March 1, 1987, to coincide with Canon’s 50th anniversary. The "EOS 650," introduced in March, 1987, employed several innovative and unique Canon technologies, including BASIS (Base-stored Image Sensor), a highly sensitive focusing sensor, and the a high-precision Ultrasonic Motor (USM). The EOS seized the top market share, not only in Japan, but also in Europe. Canon continued to enhance its EOS (Electro Optical System) cameras. In 1989, the "EOS-1," the flagship of the EOS line SLR cameras was released. The eye-controlled focusing system of the "EOS 5QD" caused a sensation when it was unveiled in November 1992. The most advanced model of the EOS camera line, the "EOS-1N," was introduced in November 1994, incorporating suggestions from users and making full use of EF-series lenses, with an electronically controlled mount permitting highly accurate real-time data transfer between the camera body and the lens. The "EOS Kiss," a fully automated, small, lightweight camera, introduced in September 1993, was designed for novice photographers, but its advanced features attracted a wide range of users. An "EOS-Kiss III" was released in April 1999. The “EOS-1V," which was unveiled in April 2000, represents the standard in next-generation 35mm AF SLR cameras, and Canon remains the world’s leading manufacturer of the 35mm AF SLR camera. In February, 1996, the Advanced Photo System was announced by five companies: Canon Inc., Eastman Kodak Company, Fuji Photo Film Co., Ltd., Minolta Co., Ltd., and Nikon Corporation. The "IXY" Canon's first Advanced Photo System camera, released in April, 1996, incorporated many advantages of the Advanced Photo System including small film cartridge size, simple film loading mechanism, and the latest miniaturization technologies. The "IXY" became a runaway hit because of its unprecedented compactness and functionality, and contributed to the general impression that the Advanced Photo System is synonymous with Canon. Since the process of developing film was not required, the SV camera offered the advantage of making images available instantaneously, but it was very expensive. To provide an affordable SV camera for general users, Canon set a target price that would not exceed 100,000 yen, and in September,1989, released the "RC-250 (Q-PIC)." The production of SV cameras ended in 1992, giving way to digital cameras. In July 1996, Canon released its first independently-developed digital camera, the "PowerShot 600." The "EOS D2000" digital SLR camera, for business use, was released in 1998, together with the "PowerShot A5" and "PowerShot Pro70" digital cameras for general users. In May 2000, Canon introduced the digital version of the best-selling "IXY" Advanced Photo System camera, the "IXY DIGITAL." The "MV-1," Canon's first digital video camcorder, made its debut in 1997, followed by a compact, lightweight, high image quality “PV1” in 1999 and the "FV10," introduced in May 2000 for family use. The professional "XL1," launched in February 1998, allowed the use of interchangeable lenses and was adopted as the official digital video camcorder of the National Aeronautics and Space Agency (NASA), traveling to outer space on board the space shuttle. Canon has continued to break ground with new EOS-series digital camera products, both for professional photographers and for mainstream consumers. In 2001, EOS-1D was marketed as a professional digital SLR targeted at sports and news photographers, while the EOS-1Ds featured an 11.1 megapixel sensor and was designed to be the perfect high-end photographic tool. Technologies developed by Canon, such as the EF lens series for SLR cameras, the CMOS sensor, and the DIGIC image processor, powered the rapid evolution of digital SLR cameras. In response to the growing popularity of editing movies on personal computers and sharing them on the internet, Canon has produced a series of compact, low- to mid-range camcorders, and the XL2, a professional-use product with interchangeable lens capability. Today, though Canon is best known to the consumer market for its cameras and computer printers, most of the company revenue comes from its office products division, especially from analog and digital copiers, and its line of imageRUNNER digital multifunctional devices. Canon has also entered the digital displays market by teaming up with Toshiba to develop and manufacture flat panel televisions based on SED, a new type of display technology. The joint venture company SED Inc. was established in October 2004. In January 2007, Canon announced that it would buy Toshiba's share of the joint venture. The name Canon began in 1934, with the Kwanon camera, which Yoshida, a Buddhist, named after Guan Yin. The Bodhisattva is known in Japanese as Kannon or, more rarely, Kwannon, and is also commonly known worldwide as Avalokiteshvara. The following year, Uchida sought a more modern sounding name for the mass market, settling on “Canon.” In English, the word means "scriptures" and implies accuracy, a desired trait in a camera. The company trademarked the name “Canon” on June 26, 1935. According to a report by the New England-based environmental organization Clean Air-Cool Planet, Canon tops their list of 56 climate-friendly companies. To demonstrate the company's commitment to protecting the environment, Canon recently launched three new calculators in Europe, called "Green Calculators," which are produced, in part, from recycled Canon copiers. Canon were the first sponsors of the English Football League, with the deal beginning in 1983 and finishing in 1986, when new sponsors Today newspaper took over. Canon's official corporate philosophy is kyosei, defined as "all people, regardless of race, religion, or culture, harmoniously living and working together into the future." Canon maintains a commitment to social and environmental responsibility throughout its research, manufacturing, distribution and sales operations. At every stage, conservation of energy and resources, and the elimination of hazardous substances is a primary goal. Canon is recognized for producing some of the world’s most energy-efficient technology. Canon practices kyosei through environmental conservation, recycling and sustainability initiatives, and through social and educational programs to benefit young people and those in need. ↑ 2.0 2.1 Canon USA, Canon Innovation. Retrieved May 22, 2008. ↑ Canon Europe, About Us. Retrieved May 22, 2008. ↑ 4.00 4.01 4.02 4.03 4.04 4.05 4.06 4.07 4.08 4.09 4.10 Canon, Canon Camera Story. Retrieved May 22, 2008. ↑ Canon, Corporate Profile. Retrieved May 22, 2008. ↑ Printer Associates, Cross reference of HP printer to Canon Engine number. Retrieved May 22, 2008. ↑ Canon, Inc., Prototype-version "Kwanon," Japan's First 35mm Focal-Plane Shutter Camera. Retrieved May 27, 2008. ↑ Canon, Inc., Applying for Canon Trademark. Retrieved May 27, 2008. ↑ Canon, Inc., History of Canon. Retrieved May 23, 2008. ↑ Reuters, Reuters Report. Retrieved May 22, 2008. Busch, David D. Canon EOS 40D Guide to Digital Photography. Boston: Thomson Course Technology, 2008. ISBN 9781598635102. Curtin, Dennis P. A Short Course in Canon PowerShot S3 IS Photography. Marblehead, MA: Short Courses, 2006. ISBN 1928873723. Curtin & London, Inc. The Canon Camera Handbook. Somerville, Mass: Curtin & London, 1981. ISBN 0930764323. Grey, Christopher. Canon EOS Digital Rebel XSi/450D. Oxford: Focal, 2008. ISBN 9780240810669. Kyanon Kabushiki Kaisha. Canon Sustainability Report, 2005. Tokyo: Canon, Inc., 2005. Kyanon Kabushiki Kaisha. Canon Technology Highlights, 2006. Tokyo: Canon, Inc., 2006. Lepp, George D., and Joseph A. Dickerson. 1995. Canon Lenses. Rochester, NY: Silver Pixel Press. ISBN 1883403162. Lowrie, Charlotte K. Canon 30D Digital Field Guide. Hoboken, NJ: Wiley, 2006. ISBN 0470053402. Shell, Bob. Canon Compendium: Handbook of the Canon System. Hove: Hove Books, 1994. ISBN 1855383756. Sheppard, Rob. Canon EOS 30D. New York: Lark Books, 2007. ISBN 9781579909710. Sherman, Erik. The Complete Idiot's Guide to Canon EOS Digital Cameras. Alpha, 2007. ISBN 9781592576159. This page was last modified on 7 January 2017, at 16:38.